DomiStock is a fully Personalized Financial Technical Analysis System that empowers self-directed investors with innovative technology. DomiStock helps you build and manage a personalized investment strategies so you can succeed. DomiStock uses a series of formulas that, when tested on historical data, have consistently outperformed any Forex pair and almost any global Benchmark Index. In 2016, DomiStock was the technical analysis software of choice in the investment project entitled "Global Macro Multi-Asset Investment Fund," conducted at Columbia University. Two portfolios were constructed and tested with simulated trading and recorded annualized profits of 69% and 80% respectively. DomiStock is used by individual investors of any knowledge and experience level and of any investment horizon. Its unique design makes it both a trading and an educational tool. It’s like having an outstanding technical analyst and a great technical analysis teacher available 24-7. That’s why DomiStock is also used by traders who care to enhance and improve their technical analysis knowledge. 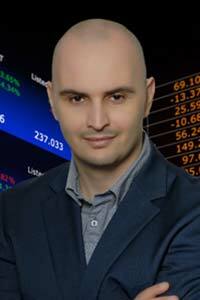 Panos is a financial markets technical analyst and automated system developer. His Robo-Hybrid "3F" trading system (1999-2012) was a European best seller while his latest one, "DomiStock", was launched as an add on to the award winning technical analysis software, "MetaStock" and was the Robo-Advisor of choice in the international research Behavioral Finance project "Robo-Advisors and Individual Investors", conducted at Columbia University, New York, in fall 2015. Panos has been publishing financial markets commentary and research for over two decades and has authored several books and e-books. His analysis and research has been published in Bloomberg, The Economist, BBC and a plethora of European Media and he was an expert consultant in a Japan’s national public broadcasting channel (NHK) documentary about the European crisis. He is a frequent commentator in economic and financial TV and radio shows. Panos studied Mathematics for Finance in Portsmouth University, U.K. and Law in Democritus University, Greece. He is a certified commercial real estate analyst by Moody’s, he holds an accounting diploma and several certificates obtained online and among others in:Financial Engineering and Risk Management - Columbia University, Asset Pricing - The University of Chicago, Economics of Money and Banking - Columbia University, Statistics for Data Science and Analytics - Columbia University, Financial Markets - Yale University, "The Analytics Edge" - MIT, Massachusetts Institute of Technology, Advanced Statistics from Harvard University, Macro-econometric Forecasting - IMF, International Monetary Fund. Panos holds a certificate in technical analysis after completing the online course taught by the internationally acknowledged technical analyst John Murphy and attended the UK’s Society of Technical Analysts course in London.